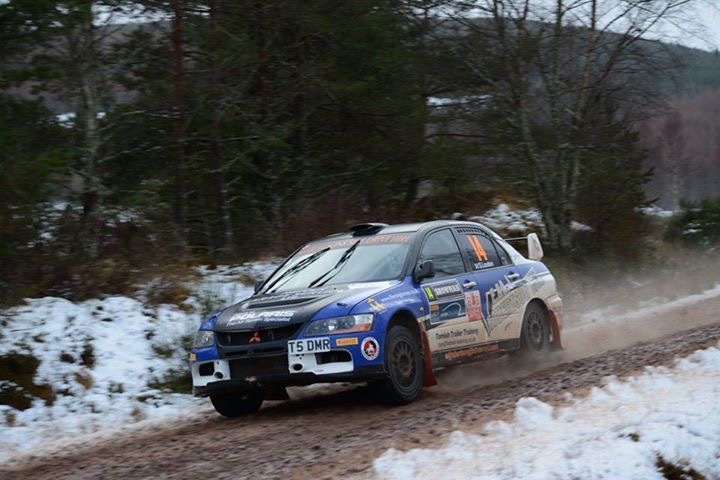 The 2016 Scottish Rally Championship got under way on Saturday with the opening round in Inverness, The Snowman Rally. Shaun Sinclair was widely tipped as being one of the dark horses for victory in his first outing in the SRC with the Subaru Impreza WRC but he retired with an engine problem on Stage 2. Dale Robertson had his car upgraded to Group A for his assault on the championship after winning Group N a couple of years ago and he surprised a few by taking second overall. John Wink has also had some upgrades done to his car over the winter and he too gave some people something to talk about with some of his stage times on his way to 12th. All the talk last week was about the lack of snow on the World Rally Championship round in Sweden. 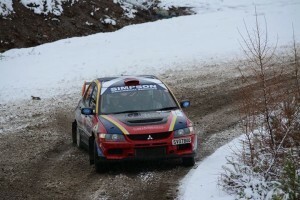 All the chat on Friday was about how much snow there was on the stages around Inverness. The organisers of the rally decided at 5 oclock on Friday night that there was enough snow on the stages to declare a winter rally. This left many scattering to find snow tyres before the start of the rally on Saturday morning. The Snowman has always been an event with mixed conditions and anyone could of and has won the event in the past. Stage 1 was the main talk of all the drivers, co-drivers, service crews and spectators. This was the stage that was supposed to have the most snow/ice on it. At just over 6.5 miles it would prove to be a very hard stage to get through. A delay of around an hour at the start of the stage due to a spectator taking ill and an ambulance having to get into the stage to provide treatment would not have helped the nerves of some of the drivers. Some of the drivers chose to have ‘punctures’ at the start of the stage in order to drop back in road position. This meant that Shaun Sinclair, seeded car 5 and originally to run 6 on the road would now run at car 3 behind Jock Armstrong and Mike Faulkner. As the cars filtered out at the end of the stage it became clear how important road position would be. Sinclair, even with snow tyres, lost well over a minute to late entry Quintin Milne who was fastest and would be lying 34th overall going into stage 2. Dale Robertson has not rallied since October 2014 and had a new co-driver for this event in Stuart Loudon. After winning the Scottish Group N title a couple of years ago Dale decided to step up to Group A and push for the overall honours. 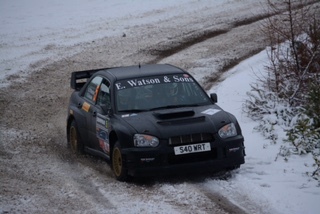 The Reiver Motorsport Evo 9 was going well in very tricky conditions and caught the car in front of him which held him up a little but he was still 13th fastest only 42 down on Milne. John Wink has had some brake upgrades and fuel upgraded to his Evo 9 over the winter and he turned some heads with 8th fastest time. Stage 2 was reported to be not as bad conditions as stage 1. Sinclair and co-driver Stephen O’Hanlon decided to have a big push after changing onto gravel tyres. The pair were reported by spectators to be “On a mission” in the opening mile until the Subaru Impreza WRC engine started to show signs of steaming and the pair would have to retire due to an engine problem. Robertson had an overshoot on the 6.8 miler and lost a bit of time. He would head into service 11th overall some 46 seconds off Bruce McCombie who had now taken the lead. John Wink and co-driver John Forrest were having a great rally and flew through stage 2 and took second fastest time to lift him up to 7th overall with three stages left. After Service Duns driver Robertson set off on a charge. He took 3rd fastest time and jumped six places to take 5th and now had one eye on a podium finish only 13 seconds from his grasp. Stage 3 wasn’t so lucky for John Wink, lost almost a minute and a half but he was still in the top 10. Anybody who thought stage 3 was lucky for Robertson were thinking again as the times for stage 4 came through. Fourth fastest time and he was now up onto the podium with 2nd placed Donnie Macdonald in his sights, 17 seconds ahead. All that was left between his first SRC podium was one 30 minute service followed by an eleven mile shoot out through Raven Rack. Once again as Roberston moved up the leaderboard, John Wink slid into a ditch and down the leaderboard. He lost over a minute with a small excursion on SS4 and with that slipped to 13th overall. So there was only 11 miles left to drive. Mark McCulloch lead by 51 seconds from Donnie Macdonald with Robertson a further 17 behind in 3rd. Rallying can be a cruel sport sometimes as McCulloch found out during that last 11 miles. A puncture to a front tyre dropping him over two minutes. Robertson was next through the stage setting 2nd fastest once again and it looked like he might take the victory but Macdonald, one of those who dropped back in the order on stage 1 came through 3rd fastest, 10 seconds off Dale’s time. Agonisingly close for Dale and Stuart to lose out on victory by just 7 seconds but they were both very happy with how the day had gone for them and it is a solid start to what looks like will be a very closely fought championship. John Wink finished the day with 1 more top ten stage time to bring his Evo 9 home in 12th overall. Also a great start to the year for him. The next round of the Scottish Rally Championship is the Border Counties in Jedburgh on March 19th.